With news of Google’s recent acquisition of Provo, Utah’s fiber-optic cable network, the Google Fiber service has been thrust back to the forefront of the tech community’s conversations. For those of you who haven’t heard about this, you’ve come to the right place. In an effort to build and develop fiber-optic-based broadband Internet infrastructure, Google started the not-so-creatively named Fiber service a couple of years back. Currently, Google offers three different Fiber plans: the first involves a free (as in $0 a month) broadband connection paid for by a $300 construction fee; with the second you have the Gigabit plan that costs $70 a month; and the third is the Gigabit + TV service plan, which costs $120 a month. The construction fee is waived for the latter two plans. The free plan offers 5 Mbit/s download speeds and 1 Mbit/s upload speeds; not bad for something you’re not actually paying for on a monthly basis. Of course, if you have the dough to spare, the two Gigabit plans offer their namesake 1 Gbit/s download and upload speeds. The Gigabit connections are touted to be up to a hundred times faster than the typical Internet speeds Americans enjoy. While today’s WiFi tech still won’t be able to maximize use of such speeds, that kind of connection should boost personal and enterprise functions in the selected cities, from run-of-the-mill web browsing to VoIP services (more info) and high-definition multimedia consumption. Over a thousand communities submitted their cases so that they might receive the Google Fiber service, but right now only 3 locations hold the distinction: Kansas City (Kansas), which was also expanded to Kansas City (Missouri) and North Kansas City (Missouri) ; Austin (Texas); and now, Provo (Utah). The Provo acquisition is interesting because Google actually takes over infrastructure that the city built—all for the low, low price of a single US dollar. The selection process took a while before the KCK announcement, and some cities and communities really went out of their way to get Google to notice their bids. Topeka, Kansas even temporarily changed its name to Google, Kansas. In the end, however, the cities mentioned above were the ones selected. 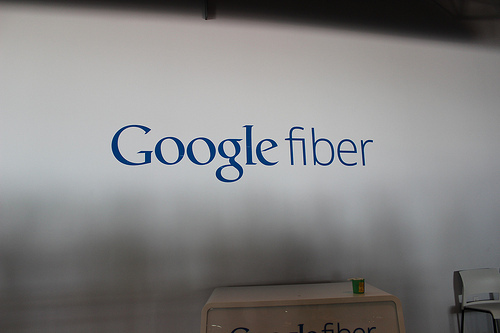 Google Fiber is a big bet for the search and technology giant. In the past, Google has been known to delve into areas well beyond its core business, and offering up city-wide high-speed Internet service is consistent with that kind of approach to the business. The company has the money to do practically anything it sets out to do, and it clearly wants to be known as an innovator. Even if Google does manage to pull Fiber off with flying colors, there’s no telling just how much of an impact it will have on Google’s core business. Considering the reach and very limited market of the service, it’s not easy to see how this helps Google in the short term and even in the long term. For Google CEO Larry Page, it’s all about providing people superior service. He said it’s all about providing products that “can make a very big difference in people’s lives.” Of course, it would also be a very pleasant side benefit if Google can make considerable sums of money while doing it. We’re not so sure about the money part, though, especially if Google doesn’t make it a point to roll out the service to the majority of US cities. It will perhaps take many, many years to truly be able to see what Google Fiber really means for the world as a whole. For now, the lucky few cities that have access to the service will be able to enjoy incredible Internet connection speeds made possible through Google, and we can only look on in envy or anticipation. Hopefully, Google will be able to expand the coverage of this service; but don’t keep your hopes up.